The long-awaited third installment in Theodore Gray's iconic "Elements" trilogy. The first two titles, Elements and Molecules, have sold more than 1.5 million copies worldwide. 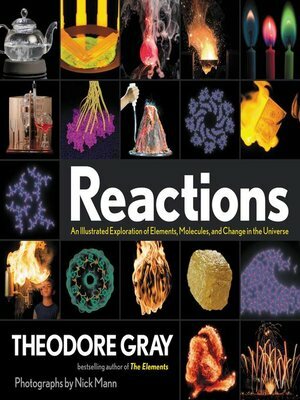 With Reactions bestselling author Theodore Gray continues the journey through our molecular and chemical world that began with the tour de force The Elements and continued with Molecules. In The Elements, Gray gave us a never-before-seen, mesmerizing photographic view of the 118 elements in the periodic table. In Molecules, with the same phenomenal photographic acumen, plus beautifully rendered computer generated graphics, he showed us how the elements combine to form the content that makes up our universe, from table salt to oxygen to the panoply of colors and smells that surround us. At last, we've reached Reactions, in which Gray once again puts his photography and storytelling to work demonstrating how molecules interact in ways that are essential to our very existence. The book begins with a brief recap of elements and molecules and then goes on to explain important concepts the characterize a chemical reaction, including Energy, Entropy, and Time. It is then organized by type of reaction including chapters such as "Fantastic Reactions and Where to Find Them," "On the Origin of Light and Color," "The Boring Chapter," in which we learn about reactions such as paint drying, grass growing, and water boiling, and "The Need for Speed," including topics such as weather, ignition, and fire.